Get your game on with the GeForce GTX 770 Graphics Card. Featuring 2GB of GDDR5 vRAM coupled to 1536 CUDA cores with a 256-bit interface, the GTX 770 can render gameplay in HD and beyond HD resolutions at fast frame rates for smooth and consistent action. Not only good for gaming, the GTX 770's CUDA cores are arranged using NVIDIA's Kepler architecture. Compatible programs can leverage the parallel processing power of the GPU to accelerate compute-intensive software using the CUDA processing platform or APIs like OpenGL. On the output panel of the card features four output ports; a DisplayPort terminal, an HDMI terminal, a dual-link DVI-D terminal, and a dual-link DVI-I terminal which supports VGA output via an optional DVI to VGA adapter. The HDMI and DisplayPort outputs support resolutions of up to 4096 x 2160. That resolution, combined with NVIDIA's Surround, can provide an immersive gaming experience using multiple monitors. For cooling, the card has an integrated blower style cooling system. This system uses a radial fan at the intake to force cooler air from the case across the card's internal heatsink and out the exhaust vent at the front of the card. This type of cooling is advantageous in compact case configurations and SLI arrays because it does not recirculate air back into the case. With a compatible motherboard and a connecting bracket, up to four GPUs of the same model can combine processing power using NVIDIA's Scalable Link Interface (SLI). How the cards work together can be customized to suit your preferences. Alternate frame rendering has each alternating card prepare the next frame, essentially multiplying the capabilities of a single card's maximum capable frame rate output. Each card in the configuration can also be used to improve anti-aliasing by being able to process an image in parallel with the other cards before filtering out jagged edges. Note: The benefits of SLI will differ based on CPU configuration. NVIDIA HairWorks - Allows for many thousands of individual hairs to be rendered and animated as opposed to earlier implementations of polygon strips and transparent textures. NVIDIA FaceWorks - Uses the additional tessellated detail provided by DirectX 11 to render faces with a more realistically round shape, with improved lighting to show contours. HBAO+ Ambient Occlusion - Adds more realistic shading and shadowing where two surfaces or objects meet. DirectX 11 allows for higher quality AO without creating a large performance hit. NVIDIA Percentage Closer Soft Shadows - Creates more realistic shadows by progressively blurring them relative to the distance of the object from the surface where the shadow is cast. The softening of the shadows also reduces aliasing which can be distracting. NVIDIA Crepuscular Rays - Also known as light rays, light shafts, or god rays, DirectX 11 renders these rays with tessellation rather than intensive ray-marching or viewspace slicing. This results in realistic imagery which has less impact on performance and graphics memory while simultaneously reducing aliasing. NVIDIA Depth of Field - Also known as NVDOF, increases precision and quality in cinematic depth-of-field effects by allowing the separation of the subject from the foreground and background. Highlights in the background can take on a polygonal character, similar to as if they had been captured with a real camera. When used with a 3D Vision compatible monitor and 3D Vision active-shutter glasses, full-HD resolution images are delivered to each eye. Additionally, with a 3D LightBoost compatible screen, image brightness will be maintained while using the glasses and ghosting will be reduced. NVIDIA's hardware accelerated physics engine computes how objects move in space in real time. Having a physics engine precludes the need for programs to pre-animate rendered objects which can give an unrealistic "canned animation" feel. The PhysX engine also allows for designers to create more detailed objects, relying on the GPU's processing power rather than a bloated programming back end. Temporal Anti-Aliasing is designed specifically to reduce temporal aliasing (crawling and flickering seen in motion when playing games). This technology is a mix of a temporal filter, hardware anti-aliasing, and custom computer generated film-style anti-aliasing resolves. NVIDIA's Adaptive Vertical Sync minimizes stuttering and tearing by monitoring and adjusting the card's frame rate output. At high frame rates, Adaptive V-Sync is enabled to slow down the output frame rate to prevent tearing as a result of losing sync with your monitor. At lower frame rates, Adaptive V-Sync will automatically be disabled to minimize stuttering. Boosts the card's clock speed in real time based on the target temperature. If the card is running below the set target temperature, GPU Boost 2.0 will increase the clock speed to improve performance. The target temperature can be reset depending on your preference so you can have the card run more quietly for everyday tasks and older games, and run at full tilt during intense high-resolution gaming sequences. Display graphics, games, and video in UHD resolution (3840 x 2160) for increased detail on 4K resolution displays. Games which support 4K resolutions will display greater detail for enhanced realism and reduced artifacts. 4K video from services such as Netflix and YouTube can deliver full resolution video for an enhanced media experience. With a single card you can expand your PC games across three displays in stereoscopic 3D for an "inside the game" experience. Add in a fourth accessory display to get access to your email, web, and other applications. NVIDIA's Dynamic Super Resolution is a scaling utility introduced with their Maxwell architecture. DSR uses the GPU architecture in order to take advantage of 4K capabilities with lower screen resolutions by having the graphics card render at 4K and then intelligently down-sample the output to fit the smaller screen. Aliasing and jagged artifacts are reduced by having a high-quality filter applied before the image is scaled down. Box Dimensions (LxWxH) 13.6 x 9.6 x 3.8"
GTX 770 Graphics Card is rated 4.8 out of 5 by 8. Rated 5 out of 5 by I dont need a nickname from Best price I could find. I couldnt be happier with my purchace of the GTX770. I upgraded from a 560ti and the frames on most games more than doubled. It runs cool at about 42c under normal load. I did alot of research and this was the card for me. The next cheapest price I found was $, $ more. I play alot of recent games and so far no problems. I also have to say delivery was fast and easy Thanks B&H. Rated 5 out of 5 by Jeff from Awesome video card I recently purchased this card as a replacement for an ADM version that was failing. Aside from the size of the card, it is rather large in length and double slot requirements, the performance and support is unparallel verses my last card. I have used Geforce products in the past and this one offers the same great support with the modern features that Nvidia has been known for. Rated 4 out of 5 by soulhan from GTX 770 Graphics Card Definitely worth the price! Solid performance from GTX770, running ultimate setting for my dota games. Was surpise that the graphic card was so large when i first unbox it, and was worried that it may heat up easily and noisy when running. But that doubt was over my mind the moment the game running. Hardly hear anything. Everything was great, even the box that comes with it. Rated 5 out of 5 by Armando D. from Worked OOB with Mac OS 10.9.5!!! This a a great GPU for multi-display use with my system!! I originally tried the IGFX (HD400) and then tried adding a second GPU(GT 520) none of these gave me the performance and stability of the 770 plus it's a reference card and I believe that makes a huge difference! Plus you can run UHD @ 60Hz from DP 1.2!!! Very nice!!! Rated 5 out of 5 by AnakAyam from Nice GPU!! This GPU really easy to install and really good. the only downside about this GPU is the size. This GPU is too big... its packed under my mid tower case. I need to rearrange my cable in order to make this GPU fit inside. but overall i love this GPU, the LED on the top make it even cooler with transparent case. Rated 5 out of 5 by I P Daily from Works Great with Dell XPS 8300 stock PSU 460watt Upgraded NVidia 660 gtx to this so I can do some Adobe Premier rendering, video file conversion, and some light gaming. Pretty powerful and was surprised it works on an old stock Dell XPS 8300 with 460watt power supply. The card requirement says 550watt. So I am very happy. Rated 5 out of 5 by Shaun from Great deal $ GPU works great. Fantastic performance upgrade for little money. Quick delivery to Australia from the US. Very happy. Will this work on a macpro mid 2012? Unfortunately this GeForce GTX 770 Graphics Card is not supported in the Mac Pro. Good day! Is it brand new? And the price is with free shiping to SA?Thank you. All items in our inventory are new unless clearly stated otherwise on the item's page, or if you are searching on the Used section of our website. You may calculate your actual shipping options/order totals by adding the items you want to a shopping cart. It will then list the shipping options, descriptions, ETA's and fees to your location. Will this work on Mac Pro? 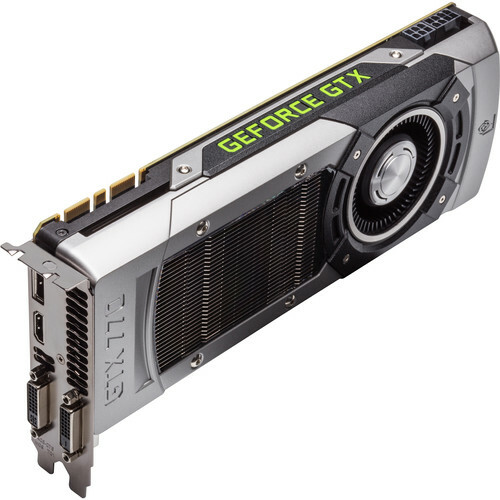 The GeForce GTX 770 Graphics Card is not supported on the Mac Pro. What brand? Or is this an nVidia factory unit? It has 3 years warranty from NVidia. what comes in the box? any power cords for my power supply? drivers? Hi, There's a CD with the drivers in the box.Keep in mind that for this card a PSU of 600W is a minimum. Normally this kind of power supply units have the necessary pin connections. There's a cable in the box fot the 6-pin and 8-pin connector of the video card.Hope this helps. What is the detail of warranty? A 3 year limited warranty is included. Will this work on a MacPro? Will this work on a MacPro 2008 Early? Answered by: TAE KYUN W.
How many 4k monitors can be connected? Thank you for your detailed answer.I just wanted to have 2 4K monitor configuration for my programming needs not for gaming.Currently, I'm using a 4K monitor with 30 MHz refresh rate and wishing to have 2 4k monitor configuration with higher refresh rate for both 4K monitors. I did not know eVGA has knowledge-full staff in customer support. This is really good information for me.Thank you for your answer and sharing your experience with me.